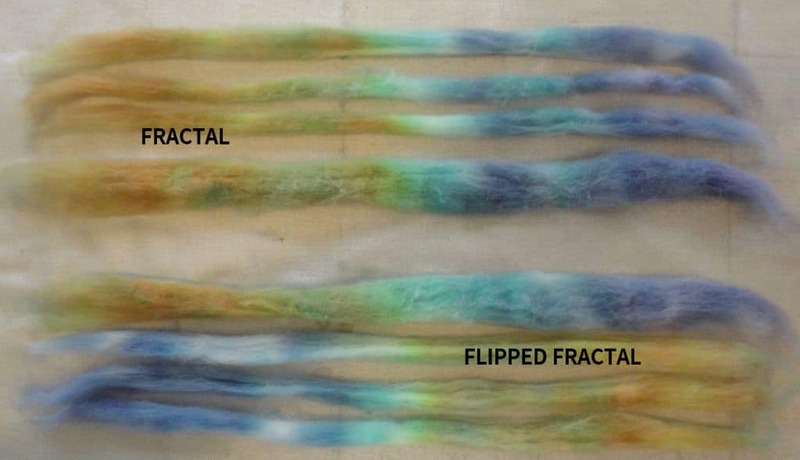 One popular method for spinning hand-dyed braids is the fractal technique. A simple definition of ‘fractal’ is when “similar patterns recur at progressively smaller scales”. In fractal art, “the same pattern repeats over and over”. Translated into spin-speak, this means splitting a hand-dyed braid into multiple sections and spinning them end-to-end, then plying the results. Start by stripping the braid in half lengthwise; set aside one half to spin onto one bobbin. Split the other half lengthwise into narrower strips, usually in halves or thirds. Spin these sections one after the other, starting at the same end as the first half. Ply the results into an interestingly color-changing marled (or barber-poled) yarn. It’s always fun trying to predict how the colors will turn out; if you’re into color control, this technique will stretch your capacity for randomness! Splitting and spinning in ‘standard’ fractal technique as shown in the top of the photo, you would end up with these color combinations – each row is one bobbin-full, which would be plied together. You can see here that the resulting yarn would include a pure section of each color. Yes! This one would result in longer stretches of mixed colors and no pure color sections, so the knitted results would have much less obvious striping. Too bad I didn’t have enough of the roving to try this one out. So that was the theory. We knew from the start it wasn’t going to be an accurate representation of the real outcome, but it was closer than I expected, and shows the color combinations in the same general order. The knitted swatches are both interesting tweedy combinations, but the flipped fractal version has more distinct striping because of the abrupt breaks where both colors change at the same time. In the regular fractal swatch, only one color changes at a time (mostly, except for the first and last bits) for softer transitions. That’s an interesting principle to remember! Swatches from the fractal spin (left) and the flipped fractal (right), with the predictions. Next time, we’ll play with a hand-dyed section of roving with four colors and see what happens there!